TIAL-R repair patch is a two-layer system consisting of irradiated high-strength polyethylene with low shrinkage degree and fiber-glass reinforced adhesive layer. The adhesive possesses high properties of shear resistance and peel strength to all types of factory polyethylene coatings. Reinforced structure adds extra resistance to shear forces.TIAL-Z defect filler is an adhesive composition with high softening point. During heating the material fills in all the surface irregularities and attains excellent adhesion to steel surface and TIAL-R repair material.TIAL-R and TIAL-Z are applied jointly for restoration of damaged factory polyethylene coatings. 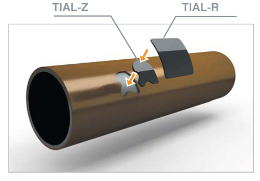 TIAL-R repair patch and TIAL-Z defect filler are certified according EN 12068 standard, class C UV. Repair materials are supplied in rolls of 30, 40 and 50 running meters. Table 1 contains information for easiest choice of repair materials quantities. If there is no strict requirements in a project reference quantity of repair materials you can choose the following data. These figures are advisory and based on TIAL wide experience to ship heat-shrinkable coatings for different projects. *Can be changed upon customer request. * Standard dimensions can be changed upon request. **Standart dimensions can be changed upon request.Quantity of each product can be stated in kg or m2 according to Table 1 or according to project requirements.